Thread: Anyone build a SS for light trail and commuting? I'm wondering if I'm the only one using my bike for both commuting and trail. yes. it even sees a mtb race now and then. I have a Bianchi San Jose that does these things very well. And road rides and whatever just not any crazy steep or rough trail stuff due to gearing and small tires. A buddy just got a pair of Specialized Armadillo Infinity 700x38 tires for his wife's commuter bike and albeit those tires could be ridden on trails. I've seen an assortment of road, hybrid, and mountain bikes ridden at our local trail over the years. I think it comes down to the tires specifically. Obviously you won't ride trails the same way on each but you can still do it. I used to commute on a pair of Spechy Armoredildos and those things were hard as nails, kinda like a solid rubber tire. No feel at all. Tough as nails too, tho. Never got a flat, but personally I'd never use them for anything but commuting or touring on pavement. Since I just got my Redline 925 I am riding the stock Kenda tires for now but have my eyes on the Armadillo Nimbus (which are backordered everywhere in 700x28). They make the Armadillo All Sport's in 700x32 but if I step up to that size I won't be able to use my current fenders. These Specialized Infinity's remind me of the Contis Town & Country, I wouldn't say ideal for aggresive trail riding but I bet you'd still do better than a stadard commuting tire. 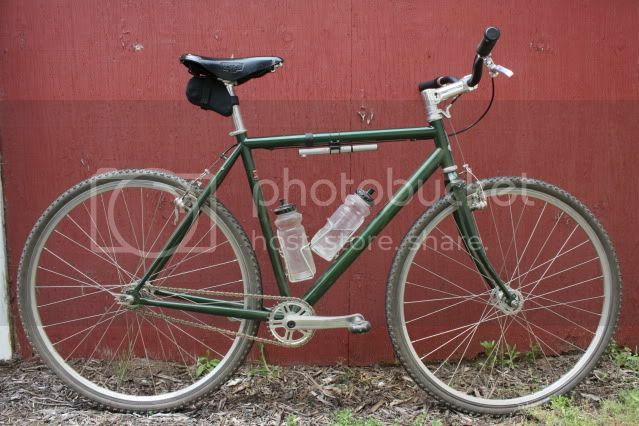 I have a Surly Steamroller that I use for light trail (700x38) and errands (700x25). What tire on the 38s? Yep. I just built up my newest commuter. A Civia Hyland with a Winwood Muddy Cross fork. Still need the fenders. 39x16 running 34c's on 30mm Salsa Semi's. Drop bars. Basically a more relaxed cross bike. Got some generic no-names (given to me by a friend). They're actually more for a "hybrid" road set up, but they do the job for mild singletracks. I plan to get some decent 30/32's come this cross season.